Hello everyone! This is Temba calling from Phakding. Today we had an early morning flight from Kathmandu to Lukla where we landed just before 7 am. From there we hiked to Phakding. We stopped for lunch in a village between Lukla and Phakding. Everything is going very good here! Everyone had a very nice walk and it is nice weather. Tomorrow we will walk to Namche where we will send some more photos of our hike! 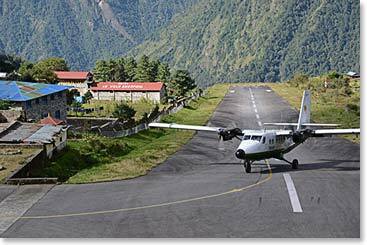 Our early morning flight arrives in Lukla. After a nice first day of trekking we arrive at our home for the night - Phakding. Tomorrow the team will hike to Namche where they will spend a few nights resting and acclimatizing. 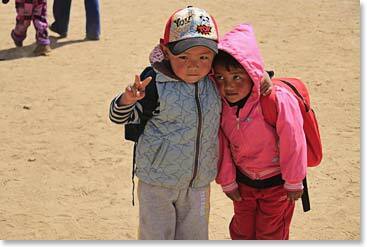 Today (April 23) in Namche was the first day of school at the Himalayan Primary School in the Namche Bazar. 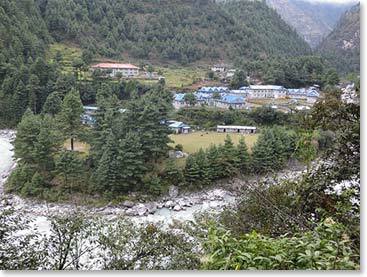 While in Namche the team will spend two nights at the Panorama Lodge. The Panorama Lodge is home to young Paljor, pictured below with his grandfather Sherap Jonbu and grandmother Lakpa Doma, who was off for his first day of school today! The school is right next door, so he will not have far to go! Along with our trekkers we send our best wishes to Paljor, his grandparents, his mother Rita and everyone in Namche! Paljor with his grandmother Lakpa Doma and grandfather Sherap Jonbu excited for his very first day of school!